Owner of the large and successful photographic suppliers Numa Petersons Handels-& Fabriks AB, in addition to his photographic display at the 1897 Jubilee Exhibition in Stockholm, Peterson built a cinema building in the style of Renaissance Stockholm, inaugurated by Alexandre Promio and managed by C.V. Roikjer. 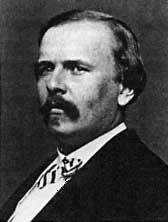 During July and August 1897, Peterson produced the short films of Ernest Florman, and at the closing of the Exhibition moved his Cinématographe to the Gamla Panopikon at 12 Kungstradgardsgatan where it ran from 27 October 1897 until 30 August 1898. In mid-1897 he sent his assistant Adolf Berggren with a Lumière programme on a tour of the small towns in the north. After his death in 1902, the company was taken over by his son, Mortimer Peterson (1867-1920), and in 1904 produced a group of sound films synchronised with gramophone records and directed by Otto Bökman, including a scene from the popular musical play The Varmlanders.